Psoriatic arthritis belongs to a group of conditions, known as spondyloarthropathies. Primarily, psoriatic arthritis is recognized as an inflammatory type of arthritis that is associated with the skin condition psoriasis and typically is negative for rheumatoid factor. Interestingly, until the 1950s, symptoms of inflammatory arthritis that occurred with psoriasis were considered to be ​rheumatoid arthritis that coincidentally occurred with psoriasis. Gradually, the two conditions were viewed as clinically distinct. In 1964, psoriatic arthritis was classified as a distinct disease entity by the American Association of Rheumatism. 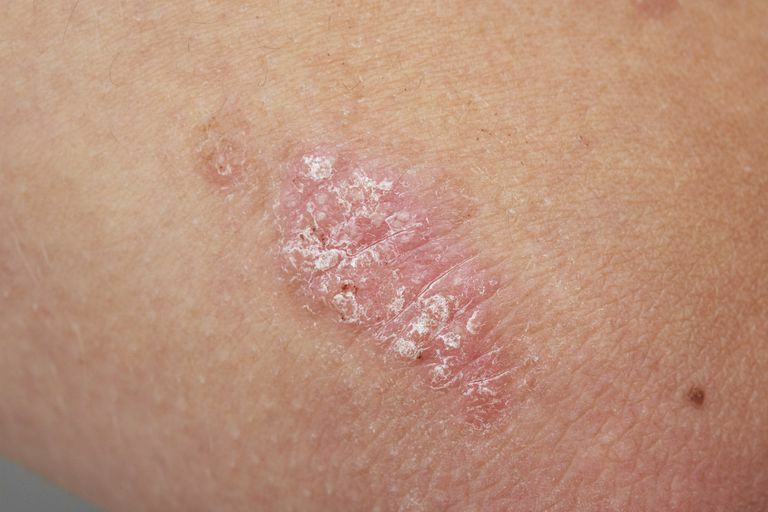 The most common pattern of skin involvement in patients with psoriatic arthritis is plaque psoriasis (also known as psoriasis vulgaris), although other patterns can occur. In most cases, arthritis develops in people who have established psoriasis. However, some patients may not be aware that they have psoriasis (for example, psoriasis can go unnoticed in the scalp), or psoriasis may develop after arthritis in about 15 percent of psoriatic arthritis cases. The pattern of joint involvement in psoriatic arthritis is not fixed though; it can vary and fluctuate. The polyarticular pattern is the most common, affecting more than 60 percent of patients with psoriatic arthritis. The oligoarticular pattern affects about 13 percent of psoriatic arthritis patients. Predominant DIP occurs in fewer than 5 percent of patients. Predominant spondyloarthritis is considered uncommon, although some spinal involvement may occur in 40 to 70 percent of psoriatic arthritis cases. The destructive form (mutilans) is considered rare, although it may develop over time, especially if inadequately treated. Typical features of psoriatic arthritis that help with diagnosing the disease include dactylitis and enthesitis. Dactylitis is characterized by sausage-shaped swelling of the fingers or toes. Enthesitis is defined as inflammation at the site of tendon or ligament insertion into bone. Most commonly, the involved entheseal sites are the Achilles tendon and plantar fascia. Other insertion sites that may be involved include the quadriceps or patellar tendons, iliac crest, rotator cuff, and the epicondyles of the elbow. Pain, tenderness, and swelling can occur, but involvement of these entheseal sites may occur without symptoms. Other features of psoriatic arthritis may include tenosynovitis (inflammation of the tendon sheath), nail problems (e.g., pitted nails), and eye problems (e.g., uveitis or iritis). Aside from psoriasis and nail dystrophy, extra-articular disease manifestations are much less common with psoriatic arthritis compared to rheumatoid arthritis. There have been suggestions that inflammatory bowel disease, as well as distal limb edema or lymphedema, may occur more commonly among psoriatic arthritis patients, but it remains uncertain. Amyloid, while considered rare, has been described with psoriatic arthritis. Diagnosticians look at patterns of joint involvement when distinguishing psoriatic arthritis from rheumatoid arthritis, as well as other characteristics. Dactylitis, DIP involvement, and enthesitis point to psoriatic arthritis. Sacroiliitis or inflammatory-related back pain seen on x-ray or MRI also point to psoriatic arthritis. Spine involvement is not considered common with rheumatoid arthritis. Conversely, the presence of rheumatoid nodules or certain other systemic manifestations points to rheumatoid arthritis rather than psoriatic arthritis. Psoriatic arthritis must also be distinguished from other spondyloarthropathies, such as reactive arthritis or ankylosing spondylitis. Dactylitis can also be a clinical feature of reactive arthritis. In psoriatic arthritis, sacroiliitis tends to be more asymmetric (one side worse than the other) compared to the sacroiliitis of ankylosing spondylitis, which is typically symmetric. Also, psoriatic arthritis must be distinguished from crystal-associated types of arthritis. Serum urate levels may be elevated in psoriatic arthritis. Synovial fluid analysis helps distinguish the two. There is no specific laboratory test for psoriatic arthritis. While a negative rheumatoid factor has always been considered characteristic of psoriatic arthritis, low levels of rheumatoid factor may occur with psoriatic arthritis. Antibodies known as anti-CCP, initially thought to be specific to rheumatoid arthritis, may be found in approximately 5 percent of psoriatic arthritis patients. Sedimentation rate, CRP, and serum amyloid A may be elevated in psoriatic arthritis, but less so than in rheumatoid arthritis patients. Kelley's Textbook of Rheumatology. Ninth edition. Elsevier. Chapter 77 - Psoriatic Arthritis. Oliver Fitzgerald. Patient Information: Psoriatic Arthritis (Beyond the Basics) UpToDate. Gladman and Ritchlin. Updated 4/9/15.